Annotation: Sophomore loner Kerry is overjoyed when three popular senior girls pick her to be in their clique, until a shocking accident sets off a string of supernatural occurrences that become more and more threatening. Contributor Bio(s): Richard Peck, author of more than thirty novels, is one of the most celebrated children's book writers in the country. He has won the Newbery Medal, the Edgar Award, the Margaret A. Edwards Award, a National Humanities Medal, and twice been a National Book Award finalist, among many other honors. He lives in New York City. Sophomore Kerry is thrilled to be allowed into a clique of super-cool seniors. 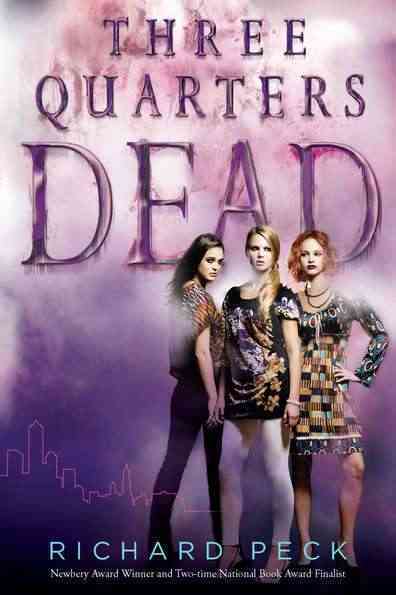 When the other girls are killed in a car crash, Kerry feels she's "three quarters dead"--until the dead return. Peck masterfully uses a first-person viewpoint to trace his protagonist's journey. Wrapping events in the shrouds of a ghost story balances his message about the power of the peer group. Copyright 2010 Horn Book Guide Reviews. In his first book set in the twenty-first century, Peck returns to his ghost-story roots. At exclusive Pondfield High School, sophomore Kerry Williamson has been allowed into the clique of super-cool senior girls Tanya, Makenzie, and Natalie -- beautiful, manipulating, and mean, like black widow spiders on the Web, texting, networking, and multitasking, busily controlling the social life of their realm. And so thrilled is Kerry to rise from nobody status to denizen of the inner sanctum that she doesn't question her good fortune. When Tanya, Natalie, and Makenzie are killed in a car crash while texting her, Kerry feels she is nothing without them; she's three quarters dead. But the dead return, and the story turns dark, with a downright macabre denouement. As always, Peck masterfully uses the first-person point of view to get inside his protagonist's head, trace her journey, and show her finally taking a stand and beginning to understand that there's a world out there beyond the peer group. There's no Grandma Dowdel here, no strong adult in this world run by children, so Kerry must find her own way. Peck's message about the power of the peer group could easily have been more didactic, but wrapping the story in the shrouds of a ghost story was a stroke of genius, making it a creepy tale middle school girls will die for...if they put down their cell phones long enough to read it. dean Schneider Copyright 2010 Horn Book Magazine Reviews. [Page 124]. (c) Copyright 2010. Library Journals LLC, a wholly owned subsidiary of Media Source, Inc. No redistribution permitted.